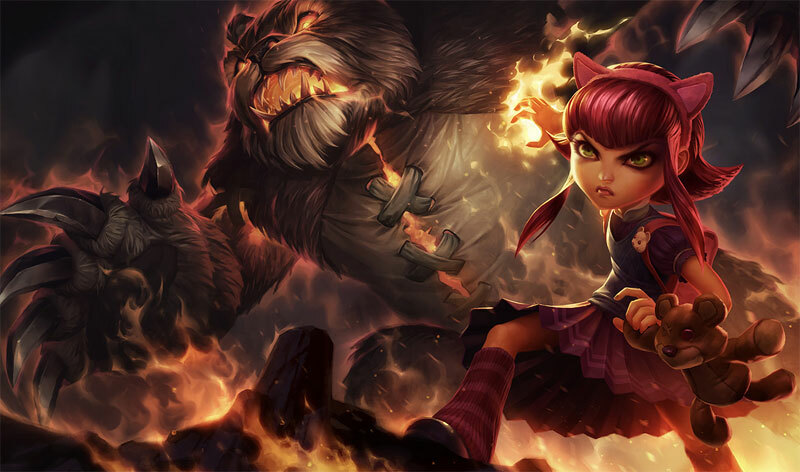 I always thought Annie was an awesome character despite the fact that I rarely played her. 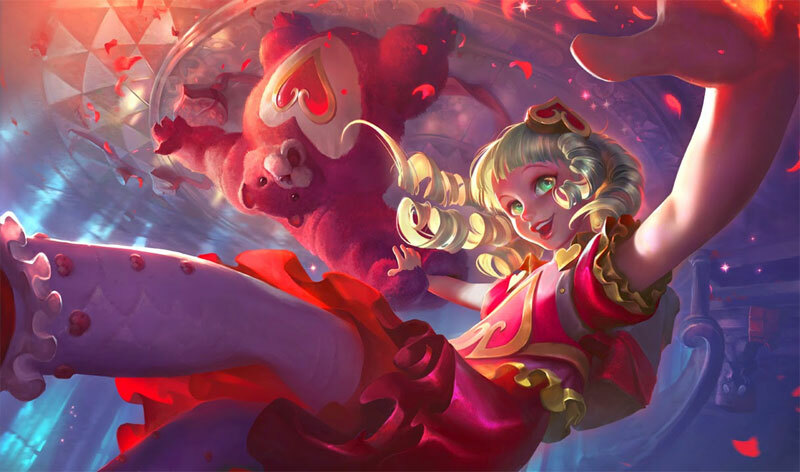 She’s just this adorable little girl who mercilessly controls this gigantic blood-thirsty shadow bear and burns her enemies to a crisp. Awwwe! SO CUTE! 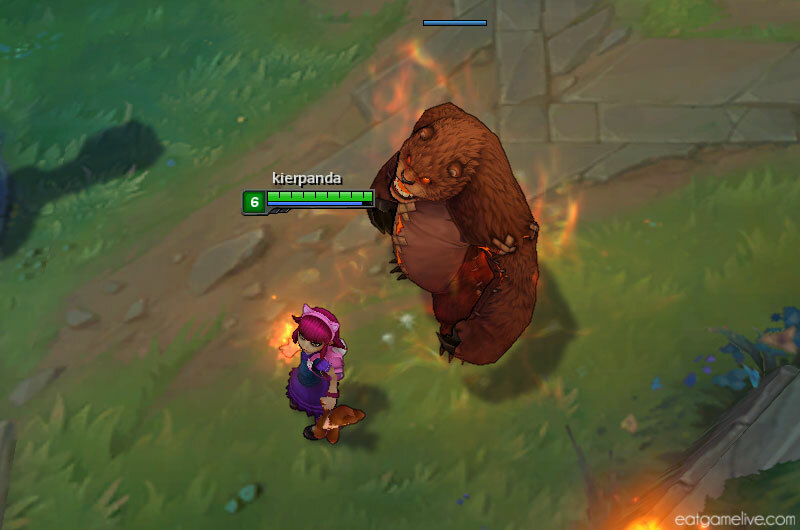 LOOK AT HOW AWESOME THAT BEAR IS! whaaaat! In addition to having a fiery kick, these macarons are also packing protein. Yep, protein! If you’re going to be playing League for multiple games, you’re going to need something to curb your hunger. 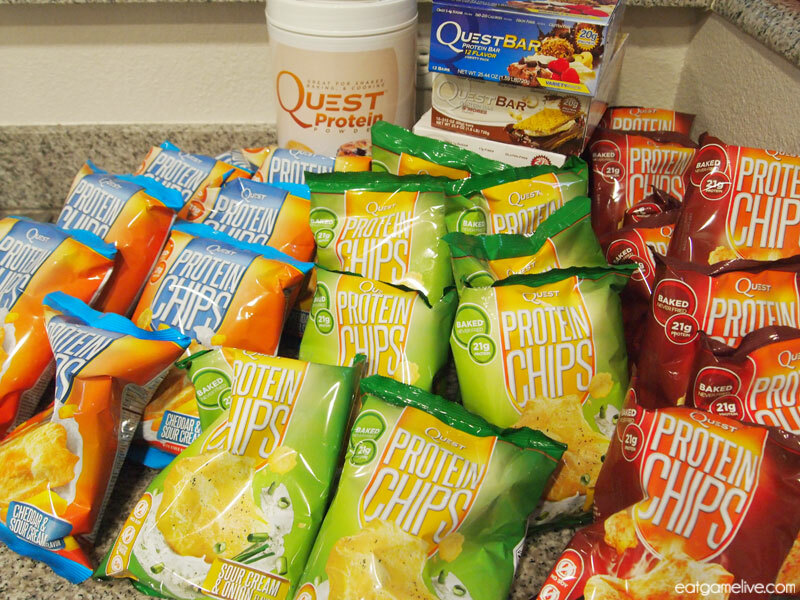 I recently found out that my favorite protein bar brand, Quest Nutrition, has begun reaching out to gamers to help promote healthy eating habits. They are big supporters of eSports and they currently sponsor one of my favorite teams: Team Liquid. TAEJA and SAVJZ HWAITING! Their gaming division, Quest Gaming, reached out to me and sent me a gigantic box of goodies! WHAAAAAAAAAAT! SO MANY DELICIOUS THINGS TO EAT! You can imagine how insanely happy I was to basically get a whole box of new fancy ingredients to play and cook with. They also sent me boxes of Cookie Dough which is my all-time favorite flavor of Quest Bar and I am trying very hard to not have Cookie Dough Quest Bars for every meal. THEY TASTE LIKE REAL COOKIES… THIS FEELS LIKE CHEATING. 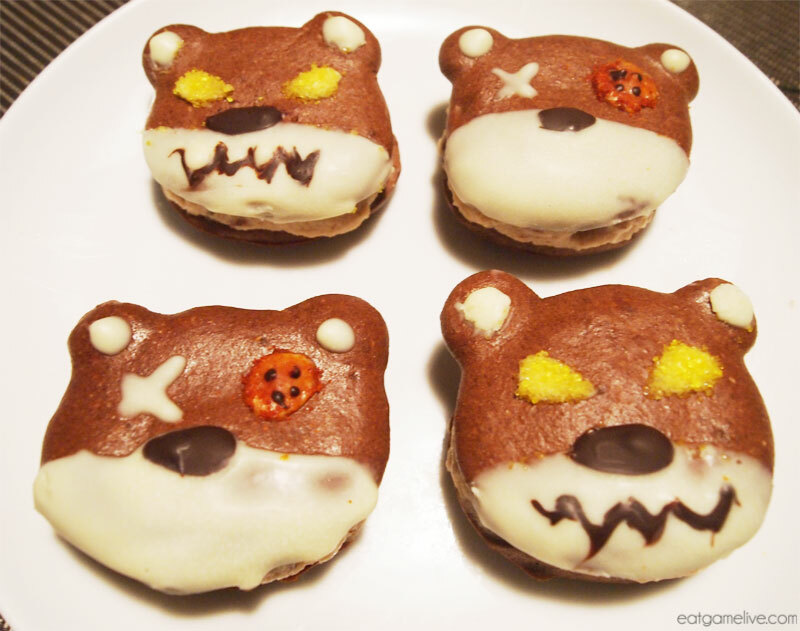 I’ve decorated the macarons to represent the plush version of Tibbers and the actual shadow bear Tibbers from Annie’s ultimate. Prep time is roughly 55 minutes (25 minutes idle time to allow the macarons to rest before baking and about 15 minutes to allow the macarons to cool before decorating) Cook time is about 18 minutes. Decorating time is about 15 minutes. This makes 4 servings. Each macaron contains about 8g of protein, and less than 1g of sugar. 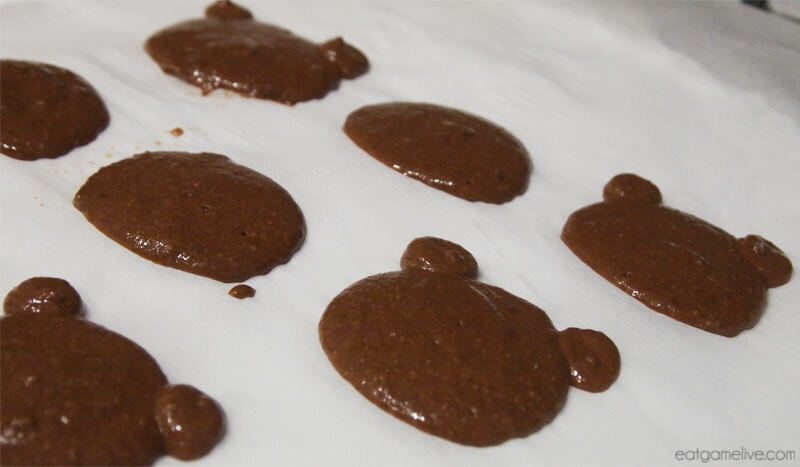 Since these macarons contain protein, they will be a denser and spongier than your standard French macarons. If you want a more traditional filling, you can make a ganache by pouring heated cream over your dark chocolate. Sift your almond meal to remove clumps. Pour your sifted almond meal into a bowl and add in your chocolate powder, cayenne pepper and cinnamon. Add in 1 teaspoon of stevia. Stir to combine your dry ingredients. In another bowl, combine your egg whites with your remaining stevia. Whisk the egg whites until stiff peaks form. Begin folding in your egg whites into the almond mixture. 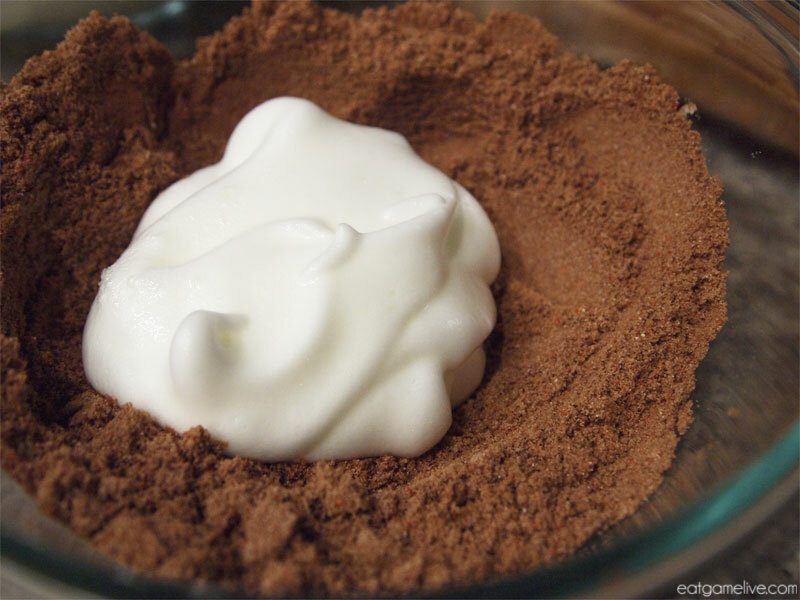 You will want to divide your whipped egg whites into thirds and add them in separate portions. Place a piece of parchment paper on a flat baking sheet. Place about 4/5 of your dough in a piping bag (or plastic bag). Cut off one of the corners of the bag (you’ll want about a 1/2″ hole) and begin piping 8 circles onto the parchment paper. Take another piping bag and fill it with your remaining dough. Cut off one of the corners of the bag, but you will want to make the hole as small as possible. Pipe two small circles at the top of 4 of the piped macaron circles. These will be Tibbers’ ears. Once you’ve finished piping out the shapes, allow the macarons to rest for 25 minutes. After the macarons have rested, bake them in the oven for about 18 minutes. During this time, prepare the filling. Set a small pan on medium heat. Add in your almond milk. 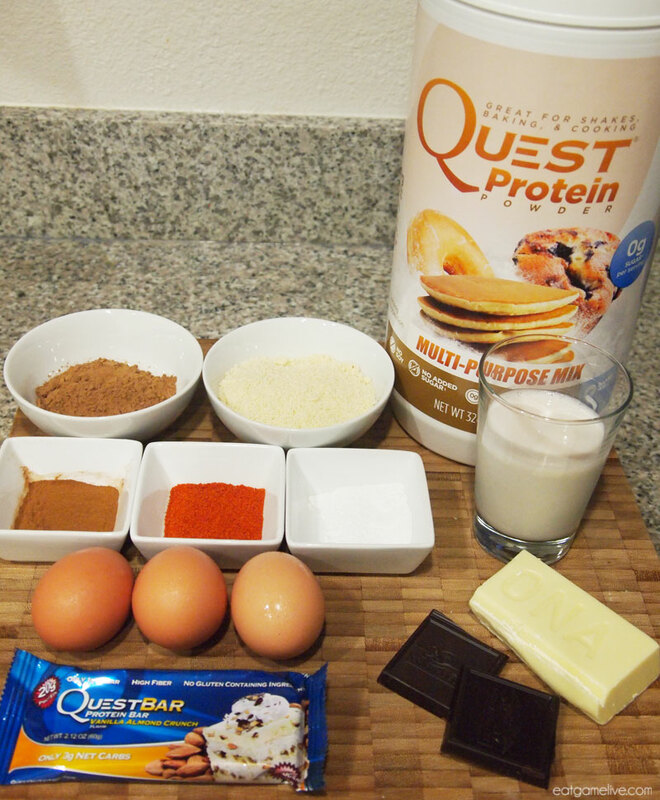 Take your vanilla almond Quest Bar and break it into pieces. Add it into heated almond milk and allow the bar to melt. Stir occasionally. Add in your extra vanilla. Stir to combine. Once the bar has completely melted, remove from heat and set aside. When the macarons have cooled, take your chopped white chocolate and melt it using a microwave. Place the white chocolate in a bowl and microwave for 10 seconds. Stir, and microwave for another 10 seconds. Repeat this process until the white chocolate has melted. Take one of the macaron shells with ears and dip the bottom half in white chocolate. Then, using a small spoon, drop small circles on his ears. Melt your dark chocolate. 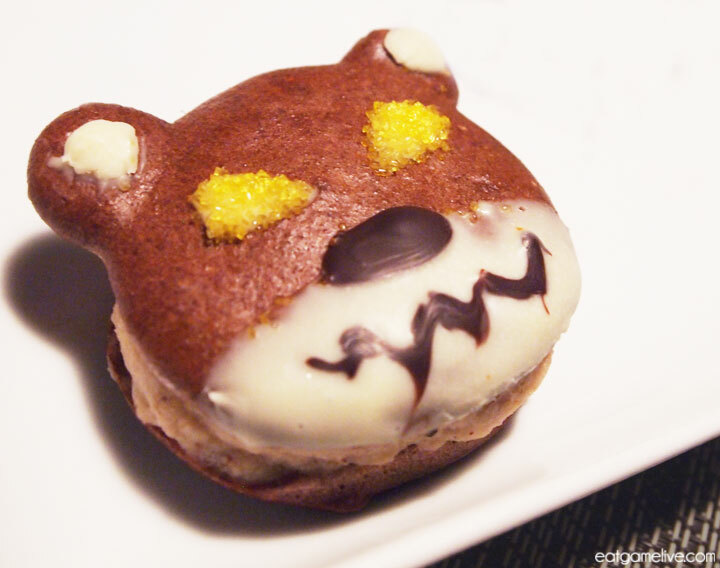 Using a spoon, drizzle an oval shape above the white chocolate to create Tibbers’ nose. Wait a few minutes to allow the chocolate to harden before proceeding to the next decorating steps. Drip a toothpick in melted white chocolate. Draw an “X” on the left side of the bear’s head. 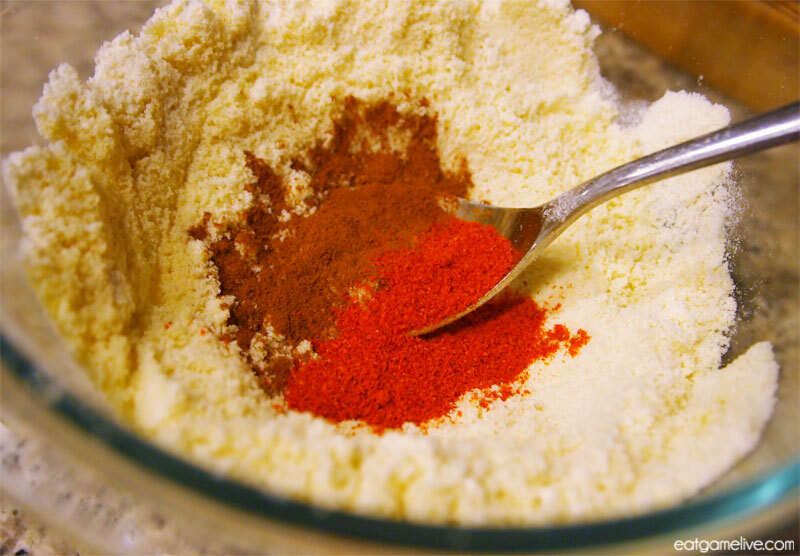 For his right button eye, combine cayenne powder with white chocolate to create a red-colored mix. 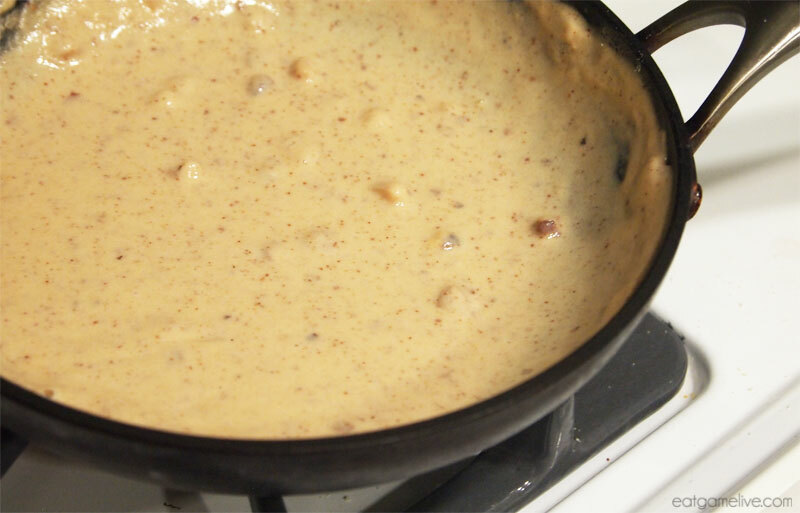 Using a small spoon, drizzle a dot of the red-colored white chocolate on the right side. Then, melt your dark chocolate. Use a tooth pick to draw 4 black dots on the red circle to replicate the look of a button. Draw two triangles out of white chocolate in the center of the macaron shell. 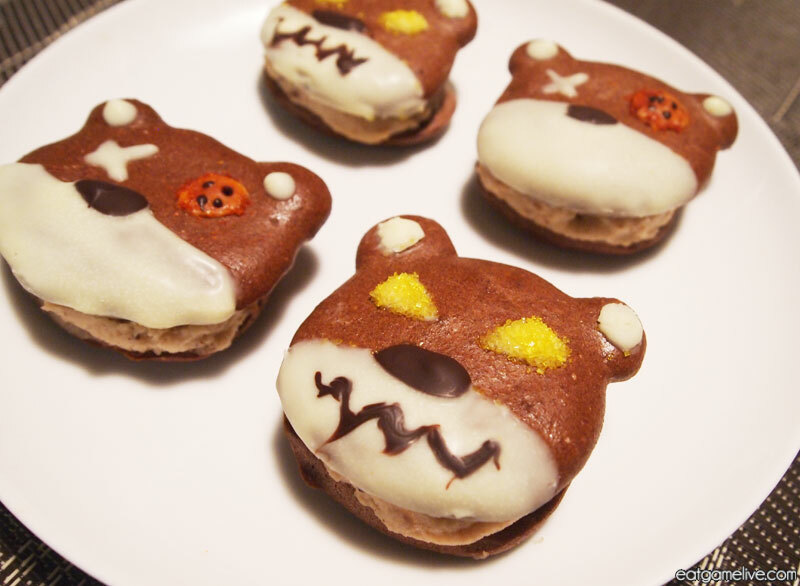 These will be Tibbers’ glowing eyes. Pour yellow sprinkles over the white chocolate. Using a small brush or tooth pick, gently brush away the excess sprinkles.Dip a toothpick in the dark chocolate. 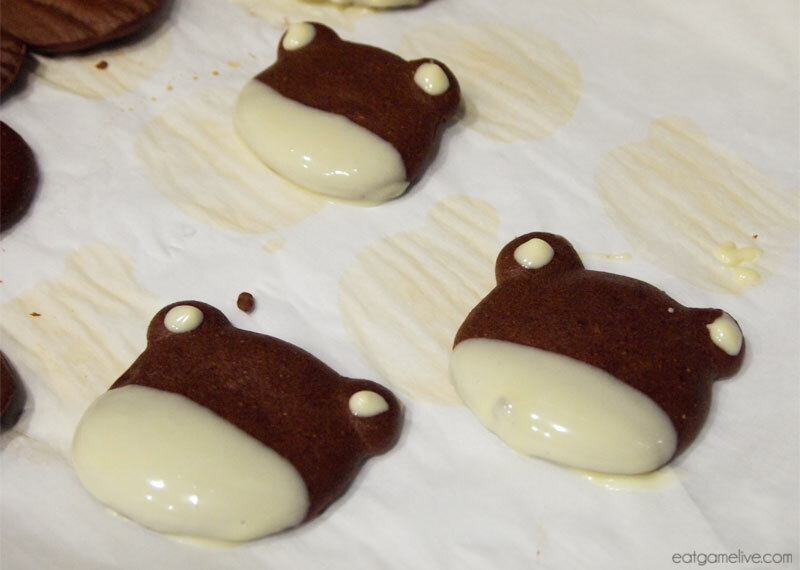 Draw zigzags in the white chocolate to create Tibbers’ teeth. 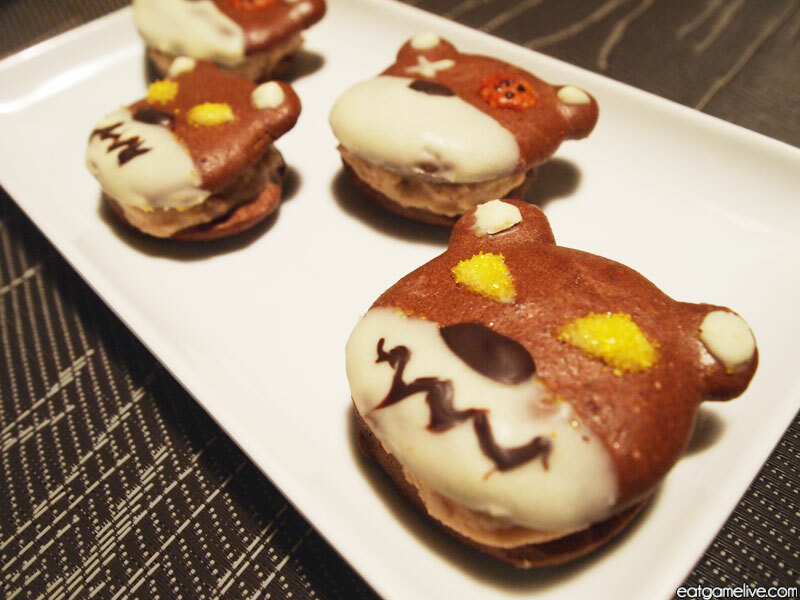 Place the decorated macaron shells in the fridge for about 5 minutes to allow the chocolate to harden. Now, take the remaining macaron shells and flip them over so that the rougher side is revealed. Using a butter knife, spread the almond filling evenly on the macaron. 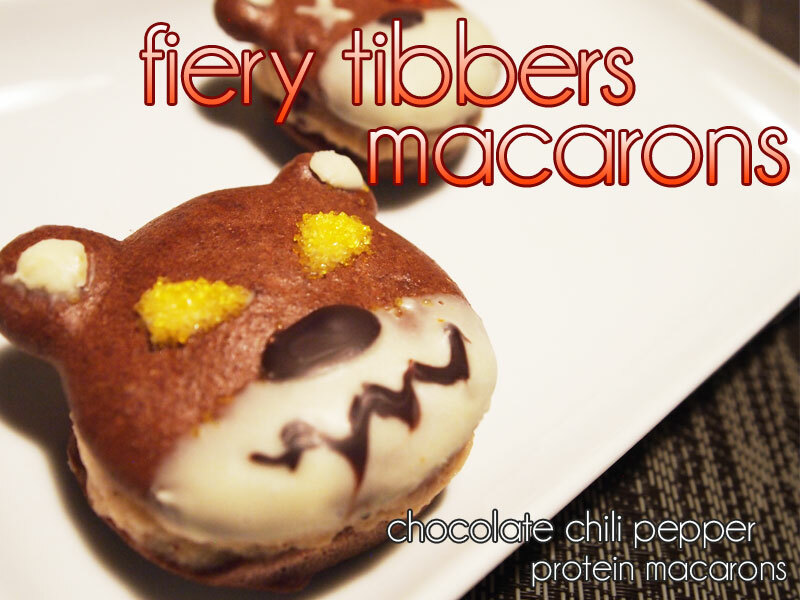 Remove your macaron shells from the fridge and gently press them down on top of the filling to complete your Tibbers macaron. 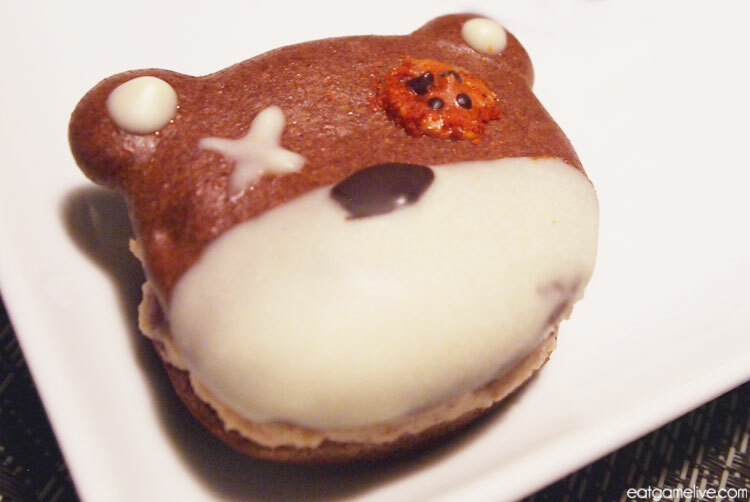 Now you can much away on these delicious macarons while incinerating the enemy champions in your next match. Don’t be a scaredy cat! This recipe was created with support from Quest Gaming. Follow them on Facebook and Twitter to learn more about how other gamers eat healthy and #CheatClean. This entry was posted in league of legends and tagged chili pepper, dark chocolate, french macarons, health food, league of legends, LoL, macaron, protein, quest, quest gaming, quest nutrition, riot, tibbers by admin. Bookmark the permalink.